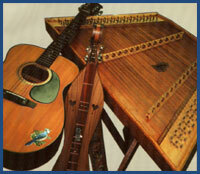 Welcome to Uncle Carl's Dulcimer Club Home Page. Uncle Carl's Dulcimer Club is a group of amateur musicians who gather together for the enjoyment of traditional folk music. We welcome any non-electrical stringed instrument, such as hammered dulcimer, mountain dulcimer, guitar, bass, fiddle, mandolin, or banjo. Meetings are held on the second Saturday of every month (September through May) at the Spring Arbor Senior Center, 122 Star Rd, Spring Arbor, MI, 49283. Click here for a map. Everyone is welcome to attend at any time. Membership is $15.00 per year. Music books are available. The Club is also available for performance. Please note there will be no club meetings during June, July, or August.